26/11/20154. 1042 Rhyl harbourmaster was supervising a yachtsman who was shifting his vessel from a mooring in Rhyl harbour to the slipway, to be recovered for the winter, at 10.42am on Thursday 26th November. As the man was turning his yacht towards the slipway, his engine failed. He was swept across the harbour and was in danger of being trapped under the new Pont -Y-Ddraig pedestrian bridge. He managed to get a line on a mooring buoy, and was held against the opposite harbour wall. 8/10/2015. 12.30 Holyhead coastguard contacted the boathouse as they had received a 999 call from a lady saying she was finding it difficult to breathe and was on the beach by the Sun Centre. An ambulance was many minutes away, and the lady required oxygen. 2 local coastguards were at the boathouse at the time, so crew from the station and the coastguards went down the beach to the woman who was conscious but having difficulty breathing. She was given oxygen and attended to by the coastguards, one of whom was an ambulance first responder. The woman gradually became calmer and she was transferred in the coastguard vehicle to the boathouse, just as an ambulance fast response vehicle arrived. She was attended to by the paramedic and the first responder at the boathouse, but was deemed to be well enough to return to her car at 14.30. Classed as a shore-based service. 1/10/2015. 0030 The ILB was requested to assist police, ambulance and coastguard personnel in assisting a person who had walked into the sea off the Sea-life centre after self-harming. The ILB launched and proceeded to the spot, only a minute away. as the ILB got there, the woman had been recovered to shore and so the ILB returned to station at 0045. 29/9/2015. 1224 The ILB was requested to launch after Holyhead coastguard reported a large white object in the water off Pensarn. The report said the object looked like an upturned boat. The ILB launched and came across the boat which turned out to be a 5-metre log. The crew deemed it to be a danger to navigation, and so the log was towed to the high water mark. The ILB crew returned to station at 1314. 23/9/2015. Our station boat D-770 “Mary Maxwell” was returned to station after repairs. The relief ILB D-768 “Robleen” was returned to into the relief fleet. 20/9/2015.1328 The ILB was requested by Holyhead Coastguard to stand by to assist a person stuck in the mud at Talacre. Coastguard teams were attending the scene as primary rescuers. The crew were on standby for nearly an hour until the coastguards reported the person had freed themselves and was safe ashore. The ILB was then stood down about 1430. Classed as a standby. 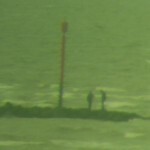 9/9/2015.1643 The crew at station noticed three young adults being trapped on a far sandbank as the incoming tide came round the sandbank behind them. They had tried to cross the Gulley but had retreated back to the far sandbank. The ILB launched into the Gulley between the sandbank and the shore, and the three were taken on board the ILB and returned to station, slightly wet but all safe at 1700. 4/9/2015.1703 Rhyl coastguard team were paged to assist fire service crews who were on route to 2 persons in the River Elwy near St. Asaph. In discussion with Holyhead Coastguard the assistance of crew members trained in river rescue were offered and accepted. Two crew and a driver were despatched from the station. They were just south of Rhuddlan when they were informed the persons were in an ambulance and they could stand down. They returned to station at 5.33 pm. Classed as a shore-based service. 30/8/2015. 1230,The crew had just started allowing the public to board the lifeboat at the station, when Rhyl harbour master reported a small leisure fishing boat with four people on board, out of Rhyl, had developed engine trouble. The All-weather lifeboat launched within five minutes, and found the boat with three adults, one child and one dog, about three miles North-West of Rhyl, around the Rhyl Flats wind farm. A tow was undertaken to Rhyl harbour, after taking two adults and the child off the boat for safety reasons due. At Rhyl harbour entrance, the tow was transferred to the inshore lifeboat to take the boat under Rhyl pedestrian/cycle bridge, so it did not need to be raised because of the impending start of the air show. The casualty was returned to it’s launching slipway at 1350. 25/8/2015. 1313 The ILB crew were paged to a report of an inflatable blowing offshore with 2 people on board, about 1 mile from Golden Sands camp, Towyn. The ILB was launched and was alongside the casualty in 7 minutes. it turned out to be a kayak with 2 people, who were OK. Their paddles may have looked like waving to the first informant. After the ILB crew checked all was OK and all safety equipment was carried on the kayak, the ILB returned to station at 1359. 23/8/2015. The inshore lifeboat crew had a very busy hour. ………..1203. Over 30 adults and children were observed cut off by the incoming tide, on a sandbank just to the west of the station. The local beach lifeguards and coastguards were dispatched to the area to warn the crowd, and the ILB was taken across the deepening gully to assist any stragglers who were out of their depth. The incident closed at 1212. ………..1246 The services were again alerted to two adults and a child on a neighbouring sandbank, cut off by the incoming tide. The lifeboat crossed the gully, took the people on board, and recovered them to the shore. The local coastguard and lifeguard teams remained in the area to oversee any persons still being cut off, and warning the public in the area to be aware of the tide coming in behind them. The lifeboat crew finished the tasking at 12.55pm. 25 people had been advised of the tide coming around the sandbanks behind them, and escorted ashore. 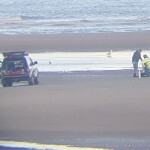 ……….1256 The coastguard team reported a small child in an inflatable, off the west end of Rhyl beach, being blown out to sea due to the offshore wind. The crew came to the dinghy, but the child was still in sufficiently shallow water to be able to stand up and self-recover to shore. The boat returned to station at 1302. 22/8/2015. 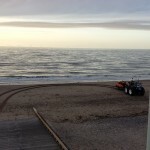 1525 The ILB was launched to an large inflatable reported about 1 mile off the boathouse. The ILB came up to the inflatable. There was no-one on board. A quick search of the area produced no results. As no-one was reported missing to Holyhead Coastguard, the crew returned to station at 1545. 16/8/2015. 1642 ILB crew were asked by Holyhead Coastguard to assist Rhyl coastguards retrieve a large quantity of commercial netting about a fair distance offshore at Pensarn, Abergele. 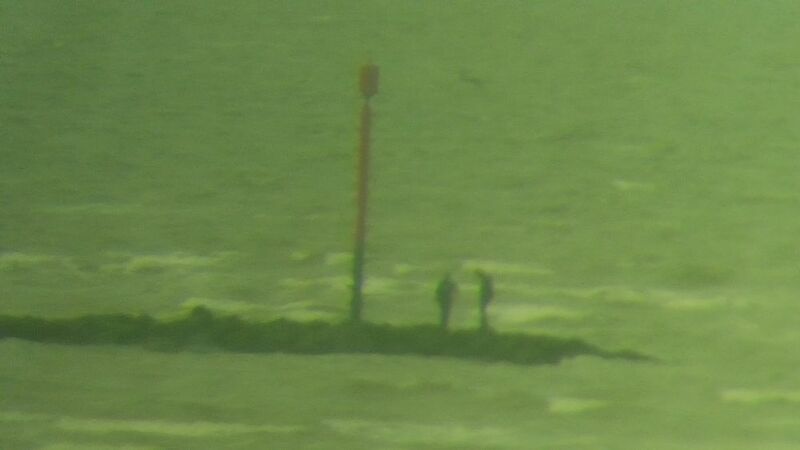 The ILB crew located the net but it was firmly anchored to the sea bed and so they were unable to recover the netting. The position of the netting was noted and the ILB returned to station at 1725. 11/8/2015. Our ILB developed a fault on service on the 10th August, so it was replaced by D-768 relief IB1 “Robleen”, and our boat was taken to the Divisional base at St. Asaph to be repaired. 10/8/2015. 0241 ILB crew paged together with local coastguards, after Holyhead coastguard were informed by police of a person threatening to self-harm by going towards the water at Kinmel Bay. As the crew were proceeding down the slipway, the coastguard said that the person had been intercepted by police and the ILB could stand down at 0251. Classed as standby. ………………..1816 ILB crew and local coastguards paged for another person threatening self-harm in the sea. Again, as the crew were assembling, the police informed Holyhead Coastguard that the person was in their care and the units could be stood down at 1830. Classed as standby. 9/8/2015. 1556 Holyhead coastguard received reports from Rhyl harbour master of a small inflatable being blown out to sea on an offshore wind from Kinmel Bay, now heading out to the North Hoyle windfarm. The ILB launched and was directed to the dinghy by the crew at the boathouse. Arriving on scene the crew came across a child’s large inflatable ring with no-one on board. The crew then ran back to windward back to Kinmel Bay to check if anyone had come out of the dinghy. At Kinmel Bay, the crew then drove parallel to the shore up to Towyn, but no-one attracted their attention. With no-one reported missing, the ILB was then instructed to return to station, arriving back at 1705. 16/7/15 1102 The ILB was launched to reports of objects in the water about 4 miles to the North-north west of the station. Arriving on scene the 2 objects were found to be fishing boxes which were returned to station in case they were part of the items from the missing fishing vessel being searched for yesterday. They were then handed over to Rhyl coastguards. The ILB returned to station at 1220. The ILB crew were already at the boathouse on standby for the Cunard 3 queens celebration, when Rhyl beach lifeguards reported 2 males on the rock groyne extending out from Rhyl harbour towards the end perch. The ILB launched within 3 minutes, and was with the males some 4 minutes later. Due to the fast rising incoming tide, the men were taken on board and returned safely to shore, the ILB then returning by 1410. The ILB crew were paged to a male in the water at Splash Point, the east end of Rhyl promenade, who was threatening self-harm. Police and local coastguard teams were in attendance. As the ILB launched, Holyhead Coastguard informed them that the man was now safe ashore. The ILB returned to station at 1905. The ILB crew were paged to attend a small speedboat at the entrance to Rhyl harbour on the outer sandbanks, being caught in the surf. The boat launched, and just as they entered the channel to the harbour, the occupant of the boat managed to restart his engine and got back into the harbour. The ILB was therefore stood down and was returning when the crew were diverted. A yacht had called Holyhead coastguard to say they had lost engine power off Rhyl and were stuck on a sandbank. There were two yachts off Rhyl, so the ILB checked them out but they were OK. Further investigations from Holyhead Coastguard revealed the yacht was actually off Rhos-on-Sea, but had now restarted their engine and all was well, so the ILB was stood down, returning to station at 1307. 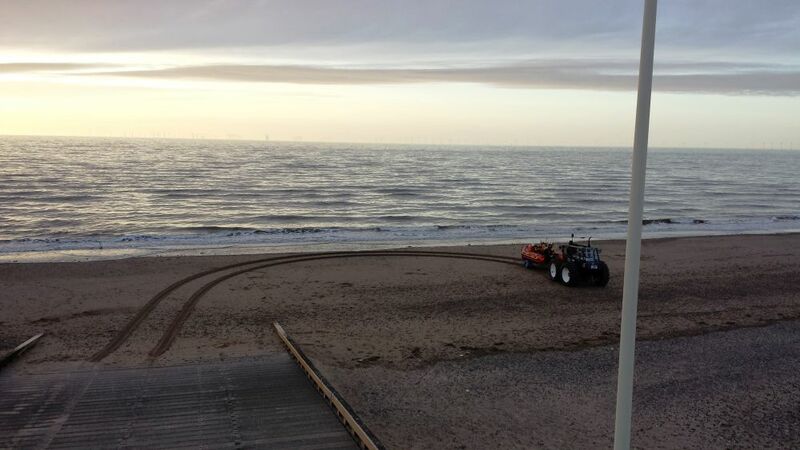 As the crew were undertaking their weekly training, the local coastguard team were paged and mobilised to West promenade to meet a person who thought they could see something in the water about 1 mile off Rhyl. The coxswain contacted Holyhead Coastguard, who agreed the ILB should come to immediate readiness (standby) at the water’s edge. The coastguard contacted the first informant who pointed out the object, which turned out to be the Rhyl fairway buoy, whish was obscured slightly by the setting sun. As all was well, the ILB was stood down at 2005. The ILB was launched after the skipper of a 7m charter fishing vessel reported he had engine failure just outside the harbour. The crew at station could see the vessel with 1 person on board. The station manager was contacted and the pagers set off. The ILB was launched and managed to successfully tow the boat back to Rhyl harbour. The skipper was taking the vessel from it’s winter berthing in Rhyl harbour compound to his local port. Local coastguards met the ILB and casualty and helped to secure the vessel. The ILB returned to station at 1245. 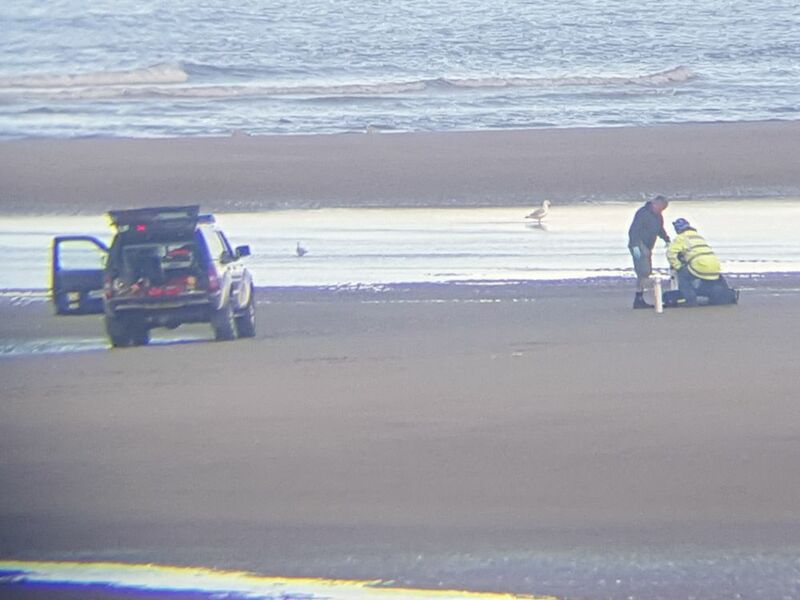 Rhyl and Flint Coastguards had succeeded in securing a drifting boat upstream of Rhyl harbour, but the owner wanted to get to the boat at low water, and wait for the high tide. The coasthuard thought this may be quite risky with the inclement weather, and the ILB was requested. The crew were paged, and proceeded to the harbour by sea. The boat was located, secured near to a rush bed, and the crew managed to get the tow line on and successfully towed the boat back to Rhyl harbour, returning to station by 1303. The crew were attending their monthly meeting when they heard a person banging on the boathouse doors below. At the same time the pagers were activated and local police officers started coming along the promenade. A man had been photographing a night view to sea and had not realised the tide had come in behind him. A couple walking along the promenade had tried to get the man to wade back to shore, but he was reluctant to do so, and they called the police, not realising 999 would also get them to the coastguard. The ILB was launched within 3 minutes, came up to the man, and returned him to shore, dry and unharmed. The ILB was ready for service at 2120.